Ah, highlighters. That old standby for readers of textbooks, contracts and instruction manuals. Whatever you might use one for, it's smart to buy highlighters in bulk so you can share them with friends, family, customers and employees. 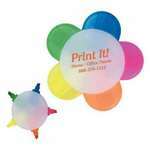 Our promotional product highlighters allow you to showcase your company in a fun and affordable way, while still providing a useful purpose. The 5 Highlighters in One is a cute, circular, and useful highlighter, which looks like a flower. 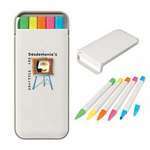 It consists of 5 colorful highlighters including: pink, yellow, blue, orange, and green. Colorfully meet almost all your highlighting requirements with the 5-In-1 Highlighter Set. 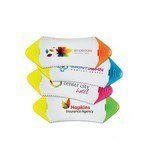 It consists of 5 highlighters including: green, pink, yellow, blue, and orange. This Baxter click pen and highlighter features a silver plastic barrel, chrome trim and simple twist action. This Brazil highlighter pen includes your choice of color on the barrel and the cap. 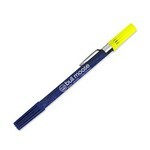 This Bristol click pen and highlighter features a silver plastic barrel and chrome trim with removable highlighter cap. Double your excitement with this unique Double Arrow Highlighter! Pick your color combination from Yellow/blue, yellow/pink, yellow/green, yellow/orange and create your very own highlighting codes. The chisel tip gives you a crisp and clean highlight with every use. Make a style statement with this and Double Exposure Highlighter & Ballpoint Pen Combo and enjoy the dual features! 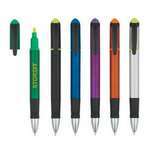 It features a black body with yellow highlighter and a ball point pen for smooth writing and highlighting. You can choose either black or blue ink for the pen with matching color cap. Make a mark and highlight your style with this Double Exposure Highlighter & Ballpoint Pen Combo! It features a Shiny Gold body with yellow highlighter and a ball point pen for smooth writing and highlighting. You can choose either black or blue ink for the pen with matching color cap. 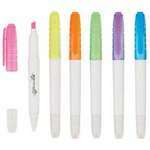 Write, highlight and write again with this Double Exposure Highlighter & Ballpoint Pen Combo! 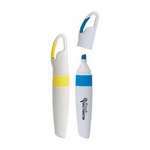 It features a Navy Sparkle body with yellow highlighter and a ball point pen for smooth writing and highlighting. You can choose either black or blue ink for the pen with Navy color cap.